If we believe that animals were created by someone for men, it would follow that men were also created for animals since some animals do eat human flesh. Animals are said to be conscious only of the present. They live with no concern for the past or future. Likewise, little children seem to have no notion of the future. They also live in the present until their faculties of memory and imagination are developed. Men possesses the faculty of reasoning. The gap between man and animal widens only to the extent that man develops his reasoning faculty and acts accordingly. Buddhists accept that animals not only possesses instinctive power but also, to a lesser degree, thinking power. In some respects, animals are superior to men. Dogs have a keener sense of hearing; insects have a keener sense of smell; hawks are speedier; eagles can see a greater distance. Undoubtedly, men are wiser; but men have so much to learn from the ants and bees. Much of the animal is still in us. But we also have much more: we have the potential of spiritual development. Buddhism cannot accept that animals were created by someone for men; if animals were created for men then it could follow that men were also created for animals since there are some animals which eat human flesh. 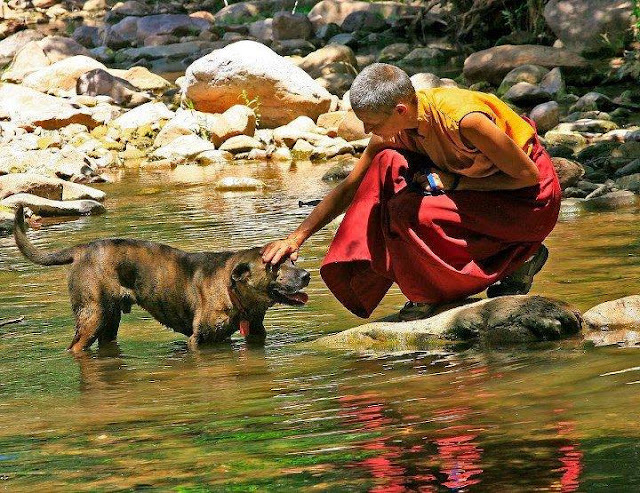 Buddhists are encouraged to love all living beings and not to restrict their love only to human beings. They should practice loving kindness towards every living being. The Buddha's advice is that is not right for us to take away the life of any living being since every living being has a right to exist. Animals also have fear and pain as do human beings. It is wrong to take away their lives. We should not misuse our intelligence and strength to destroy animals even though they may sometimes be a nuisance to us. Animals need our sympathy. Destroying them is not the only method to get rid of them. Every living being is contributing something to maintain this world. It is unfair for us to deprive their living rights. Some cry over a little bird or goldfish that expired; others travel long distances to catch fish on a nasty hook for food or mere pleasure or shooting birds for fun. Some go into deep jungle for hunting animals as a game while others spend a lot to keep the same animals at home as their pets. Some keep frogs to foretell the weather; others cut off their legs and fry them. Some tenderly tend birds in gilded cages; others serve them for breakfast. It is all quite confusing. One thought stands out in a world where man clubs man for gain or sheer gore, there is hardly time to ponder over his morals in relation to animals. Every religion advises us to love our fellow humans. Some even teach us to love them more if they belong to the same religion. But Buddhism is supreme in that it teaches us to show equal care and compassion for each and every creature in the universe. The destruction of any creature represents a disturbance of the Universal Order. Man's cruelty towards animals is another expression of his uncontrolled greed. Today we destroy animals and deprive them of their natural rights so that we can expend our environments for our convenience. But we are already beginning to pay the price for this selfish and cruel act. Our environment is threatened and if we do not take stern measures for the survival of other creatures, our own existence on this earth may not be guaranteed. It is true that the existence of certain creatures is a threat to human existence. But we never consider that human are the greatest threat to every living being on this earth and in the air whereas the existence of other creatures is a threat only to certain living beings. Since every creature contributes something for the maintenance of the planet and atmosphere, destroying them is not the solution to overcome our disturbances. We should take other measures to maintain the balance of nature.